A finished Aluminium product such as strip which has been wound or coiled after rolling. These Aluminium Strips are available in Al 99.5 and E-Al 99.7 pure aluminium 1050, 1060, 1070, 1100, 1145, 1200, 1350, 2024, 3003, 3004, 3005, 3104, 5005, 5050, 5052, 5056, 5182, 5252, 5657, 5754, 6061, 7075, 8006, 8011, 8079, 9020. Re-rolled aluminum strip available in a wide range of precise thickness and width capabilities for consistent and tight gauge tolerances. 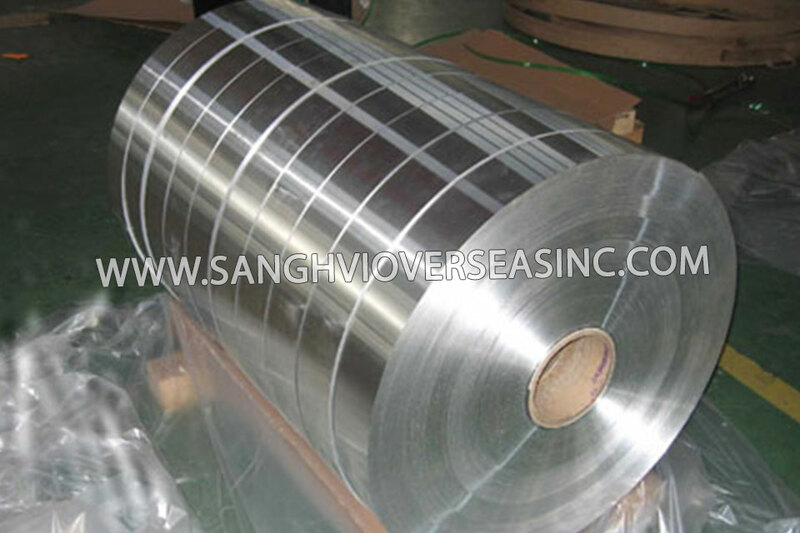 Sanghvi Overseas Incorporation is the leading manufacturer and exporter of Aluminium Strip. Supplier of ASTM B209 Aluminium Strip in Tempers manufactured in accordance with international standards ASTM B209, ASME SB 221, EN573, and EN485, check Aluminium Strip price. 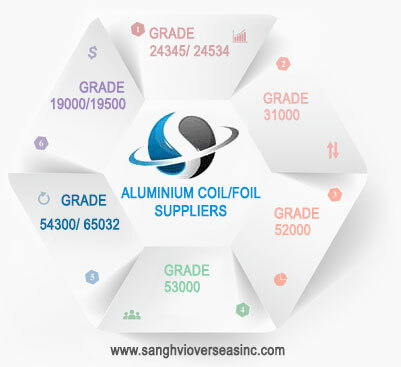 Wholesale Trader of Commercial Aluminium Strip offered by Sanghvi Overseas, Mumbai, India. Stockist of Aluminium Strip, Mill Finish Strip, Jindal / Hindalco Cold Finished Strip and Aluminium Cold Drawn Strip in India. 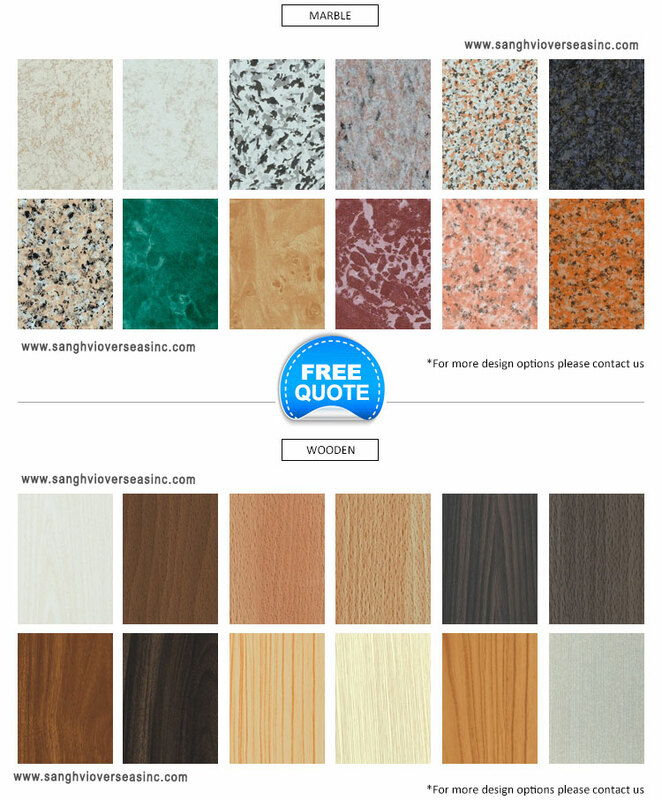 Kind attention: Specifications can be customized as the customer’s requirements. We Export Aluminium Strip to Singapore, Indonesia, Ukraine, Korea, Thailand, Vietnam, Saudi Arabia, Brazil, Spain, Canada, USA, Egypt, Iran, India, Kuwait, Dubai, Oman, Kuwait, Peru, Mexico, Iraq, Russia, Malaysia, etc. An extruded aluminum Strip manufacturer transforms aluminum alloy into an amazing variety of useful products. Making the most of aluminum’s malleability, the extrusion process creates shapes by heating a billet, or cylindrical log, of aluminum alloy to soften it and then forcing it under high pressure through a special steel die using a hydraulic press or ram. The end result is a piece of aluminum that will maintain the specific shape of the die. In this process, Aluminium Strip being drawn is at room temperature (i.e. Cold-Drawn). The pointed/reduced end of the bar, which is smaller than the die opening, is passed through the die where it enters a gripping device of the drawing machine. The drawing machine pulls or draws the remaining unreduced section of the bar through the die. The die reduces the cross section of the original bar, shapes the profile of the product and increases the length of the original product. We supply Aluminum Strip in these tempers (H32 or H22), (H34 or H24), (H36 or H26), (H38 or H28), (H12 or H22), (H14 or H24), (H16 or H26), (H18 or H28). When ordered as H2x tempers, the maximum tensile strength and minimum yield strength do not apply. When H2x tempers are supplied instead of ordered H1x or H3x tempers, the supplied H2x temper material shall meet the respective H1x or H3x temper tensile property limits. T72 temper is applicable only to Aluminum 2024 Strip and Alclad 2024 Strip solution heat treated and artificially overaged by the user to develop increased resistance to stress-corrosion cracking. Aluminum 2219 Strip and Alclad 2219 in the T31, T351, and T37 tempers for finished products is not recommended. This specification covers high magnesium marine application aluminum-alloy in those alloy tempers for Strip in the mill finish that are intended for marine and similar environments. Aluminium Strip is the most widely used form of Industrial Aluminium. Aluminium Strip find applications in various industries such as manufacturing cans and packages, transportation, home appliances, building and construction. Lighting, solar reflection, building exterior and interior decoration, ceiling, metope, furniture, cabinets, elevators, signs, Ming aluminum card, luggage, automotive interior and exterior decoration, interior decoration, such as picture frames, household appliances, refrigerators, microwave ovens, audio equipment, machinery parts processing, mold manufacturing, chemical/thermal insulation pipe coating.